Sometimes you may use a multi-octave electronic instrument such as a synthesizer to replicate the sound of some other instrument, one you don�t normally play, such as a bass clarinet or mandolin. That means you need to take care not to play outside the unfamiliar instrument�s natural range. The Musical Instruments Poster shows which notes (referenced to an 88-key piano)�and which corresponding frequencies�define the natural ranges of most popular instruments. So, even if you have never played the instrument you are emulating with your electronic keyboard, you can at least make sure you�re playing exclusively within the emulated instrument�s natural range. The 88-key piano keyboard displayed across the middle of the poster visually aligns with the range bars of all the instruments and voices. The left and right ends of each instrument�s range bar align exactly with their corresponding piano keys. 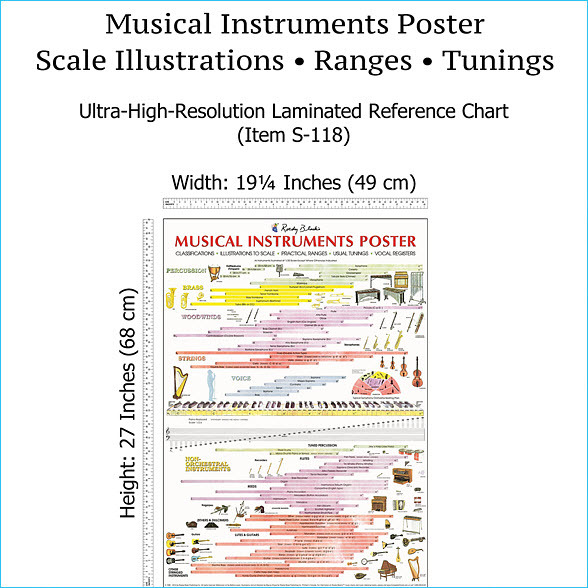 Except in a few cases (noted on the poster), each instrument is illustrated at 1/30 scale on poster size �A� (regular size). This includes a 1/30-scale silhouette of a person, so you can compare the size of any instrument relative to the size of a person. As well, there is a diagram of a typical symphony orchestra seating plan.